I always encourage my kids to play outdoors. I believe that they need the physical exercise to promote a strong and healthy mind and body. 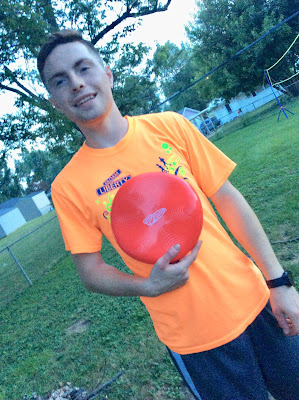 Wham-O, the toy company that has been producing some of the most trusted toys in the market for 70 years, has reinvented the way the Frisbee® and all other discs will fly in the future. The new Frisbee Sonic encourages physical activity involving skill and exercise. The Sonic a completely unique Frisbee® experience. 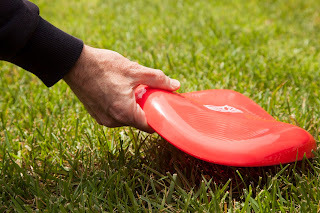 According to the company, it actually works better than the traditional Frisbee®. The square-like, sine wave shape mimics many things in nature. The alternating twists and turns of the design resemble a bird in flight as it spins through the air. It is available in two colors - red and green. I have a large back yard and have been using it this summer as an area to play outdoor games with my older kids. Me and Logan have especially taken advantage of the nice weather to get outside and throw the Frisbee Sonic back and forth. It's amazing how something so simple can be so much fun. With the right throw and aim, the Frisbee® Sonic flies far. It can be thrown using different hand variations to give the speed, direction, and distance you want. It has an easy-to-grip contour. Logan's better at throwing and catching but I enjoy the time to bond and get some exercise. I need to let my sons know about this. They are both grown, but they still like to toss Frisbees.